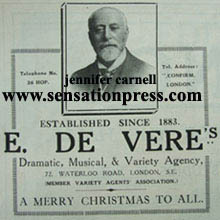 Ernest De Vere (c.1854-1938) was a former music hall singer who founded his own dramatic, musical and variety agency in 1883. He real name was Ernest Brisker and he was born in Bohemia. He moved to London with his parents and sisters and began his career as a commercial clerk. In 1879 he married Eliza Ann Pullan in Thirsk, Yorkshire. His wife was a music hall singer under the name of Stella De Vere, and Ernest changed his stage name to De Vere and joined her as a vocalist. His agency was located in Waterloo Road, Lambeth. Copyright © 2012 - 2017, The Sensation Press, All Rights Reserved.